Last night, I went along to The Telegraph to take part in a focus group, about various aspects of the paper. A completely mixed group discussed values, requirements, possibilities and likes and dislikes (yes, I’m being vague, they’re doing research and it’s polite not to mention what on) It was a surprisingly fun 90 minutes as we all got a chance to express what we thought of the paper. 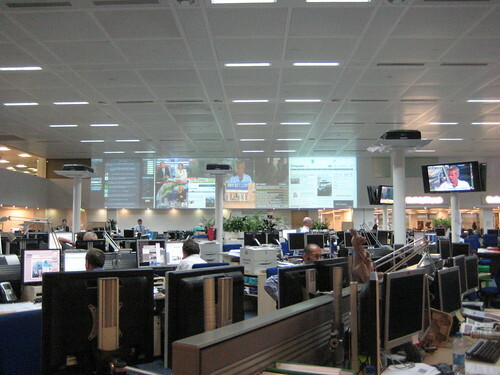 Then we had a quick tour of the newsroom which gave me an insight into what happens. it’s a hub and spoke mechanism, with the editors meeting taking place in the centre. the closer you are to the centre the more ‘important’ you are in making editorial decisions. Despite all the technology present, there was still a layout board with a bunch of papers and a scalpel sitting there. They have what looks to be Twitterfall running continuously on a big screen, with an eye on the trending topics. This entry was posted in events, life by Rachel. Bookmark the permalink.